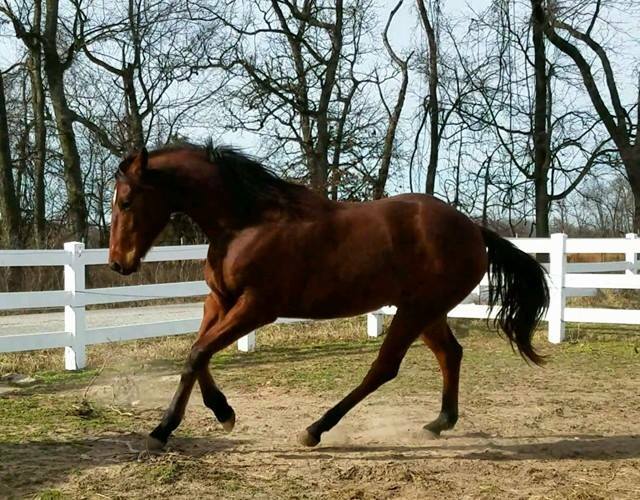 Ikes Dash For Cash was born May 22, 2015 out of Showtime Magic, sired by Ikes Tivio. This is a colt that we are very excited about. He is pictured above as a long yearling. Check out this pedigree: http://www.allbreedpedigree.com/ikes+dash+for+cash! His pedigree is impeccable, he is well built, very intelligent and he is showing great promise to be a true athlete. Cash's dam is an own daughter of Special Show with SI-99/AAA/ROM, earner of $150,812, won Black Gold 440 Futurity, 2nd Black Gold Derby, sire of earners of over $1,149,921. 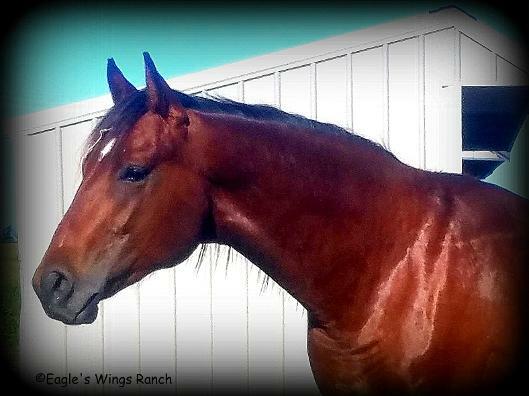 Special Show is son of the one and only Special Effort SI-104/AAAT/ROM, earner of $1,219,948, AQHA Hall of Fame 2008, won All American Futurity, Rainbow Futurity, Kansas Futurity, AQHA Triple Crown Winner, World Champion Race Horse, Champion 2 year old, At 3: Won Kansas Derby, 3rd-All American Derby. Champion 3 year old. With 1,373 starters in 20 crops raced at the time of his death, Special Effort has been represented by 877 winners, including 73 stakes winners that scored in 126 stakes, 91 stakes placers and the earners of $18,162,615. And of course Special Show's dam, an Easy Jet daughter, was special in her own right with SI-107/AAAT/ROM, dam of 3 foals all winners/ROM. And let's not forget Magic's maternal line which is just as impressive! 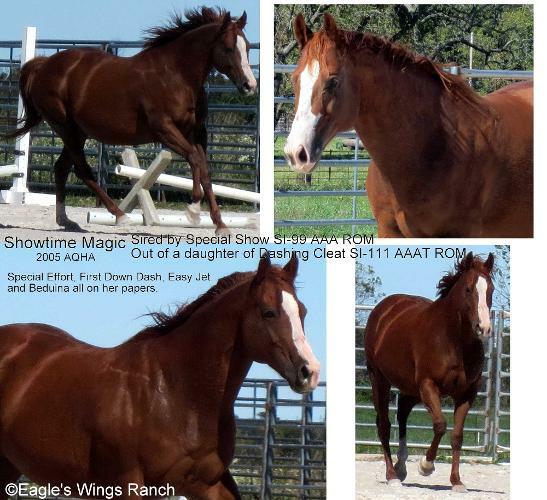 Magic is out of an own daughter of Dashing Cleat, AQHA Race SI-111/AAAT/ROM, earner of $77,872 (at 2 and 3 yrs), 12th leading barrel sire for 2002, offspring earnings: $46,461, average per offspring $7,744, 6 race money earners over $100,000, progeny earnings total over $4.5 million. Cash's sire, Ikes Tivio, is a son of Driftin Tivio, the most famous and consistently successful cross of Poco Tivio on Doc Bar mares in the history of the cutting horse. He specialized in cutting, reining, and foundation breeding, NCHA Bronze Award, $11,188, NCHA Top Ten twice. Ikes Tivio's dam is by White Lighting Ike, sire of NCHA money earners and Equi-Stat Offspring BR LTE: $25,383. White Lighting Ike is a son of Driftwood Ike with 54 AQHA Performance points, a ROM in Open Performance, and AQHA High Point Open Steer Roping-2nd. 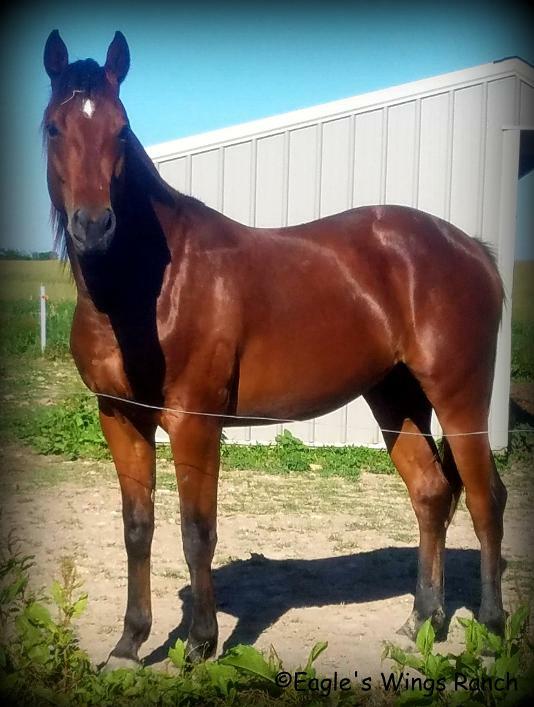 His offspring included ROM in Race, Performance and Arena, AQHA Champions, Producing daughters, AQHA high point earners, Stakes Winners, AAA & AA, and earners of 222.5 Performance points. 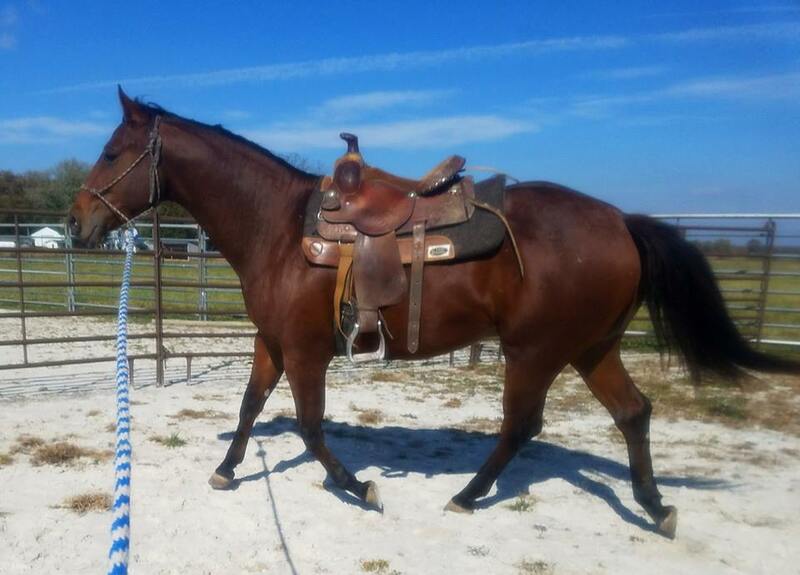 Ikes Tivio's is out of a daughter of Ed Echols Jr who sired ROM in show, Race Starters, and Point Earners, son of Ed Echols-AQHA Race SI-75/A/ROM, leading maternal grandsire of AQHA Champions (20); sire of 8 AQHA Champion, 20 Performance ROMs, 27 Race ROMs, 2 year-end high point, 3 Superior Performance. We really expect spectacular things out of this colt! 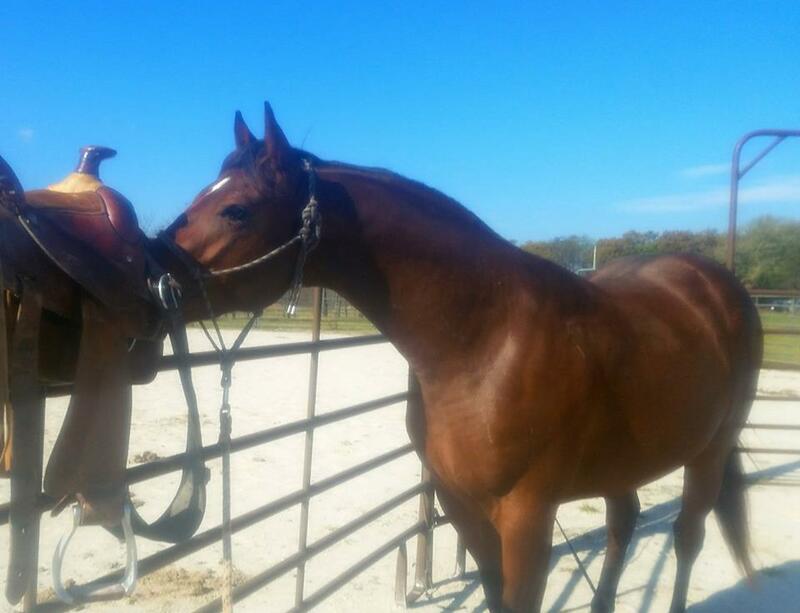 He will be started under saddle slowly as a 3 yr old but he is already proving to have a curious intellect and impressive athleticism. I bred and raised this colt with every intention of him staying with me his entire life. However, my life has taken a turn away from the horses for right now as I focus more on our dairy herd. Because of this, I have decided to offer Cash for sale, as painful as that is for me. However, he does not have to sell and he is not on sale so please don't low-ball me. You won't get this quality of horse for cheap, if you can even find it available. I am perfectly happy to keep him until I have more time for him but he has so much potential that if the right home comes along, I would let him go to an approved home. I realize these pictures are very outdated, he has filled out considerably so I will work on getting recent pictures of him soon. 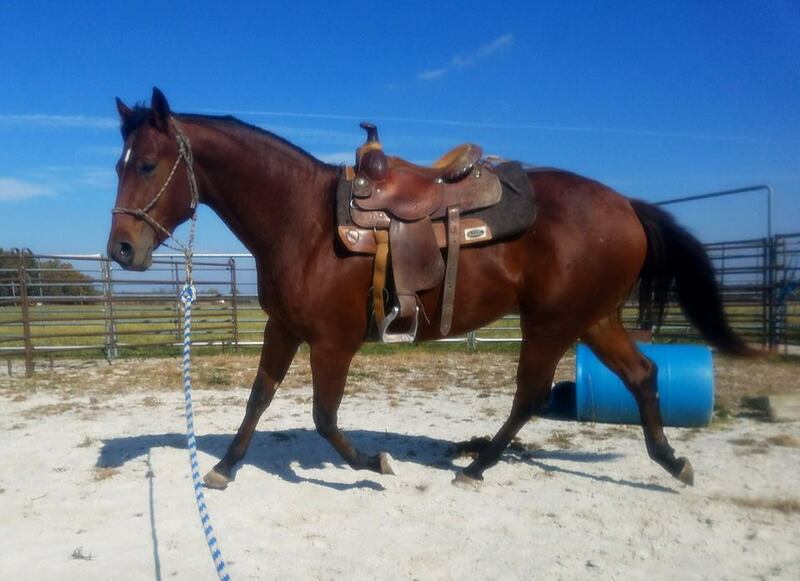 He has been saddled once as a 2 year old and he took to it like he had been saddled every day his entire life. No hump or even a second look and he easily carried it at walk, trot, lope with no issues. Cash is for sale to an approved home. Please inquire for price. The following three pictures are Cash's first time seeing a saddle as a 2 year old.